"Not like this. Not like this." Eli Bard is a mysterious character who has been hanging around the anti-mutant group the Purifiers...basically crazy religious people with guns who hate diversity in the human race. So yes...republicans. Anyway, Carl Rove a.k.a Eli Bard, stays behind the scenes for a while until the end of X-Force #6 (volume 3) where he bonds with some techno-organic creature and then of course gets away. In X-Force #11 readers are basically treated to a campfire horror story by Warpath where he explains Eli Bard's origin story. Most of the issue is in simplistic art that is a flashback going back to the times of the Romans. Eli has a few years under his belt. The comic of the day eventually gets back to current time with about 2 pages left which is actually interesting, and leads into another future X-Force story. The comic of the day is boring. Most of the time a story being told to you through narration without much dialog is no fun. It gets the information across quickly, but it feels lazy and like a quick way to explain something that may be complicated. Alright. 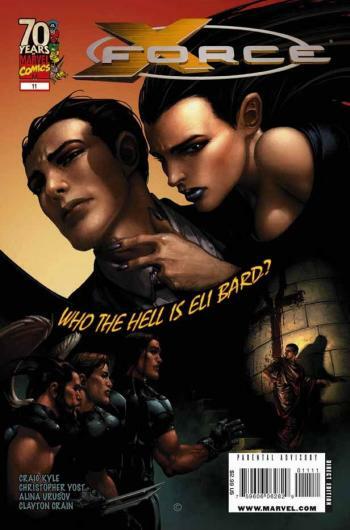 I know who Eli Bard is. Moving on to X-Force #12. Yeah, I've been reading a lot of X-Force lately.